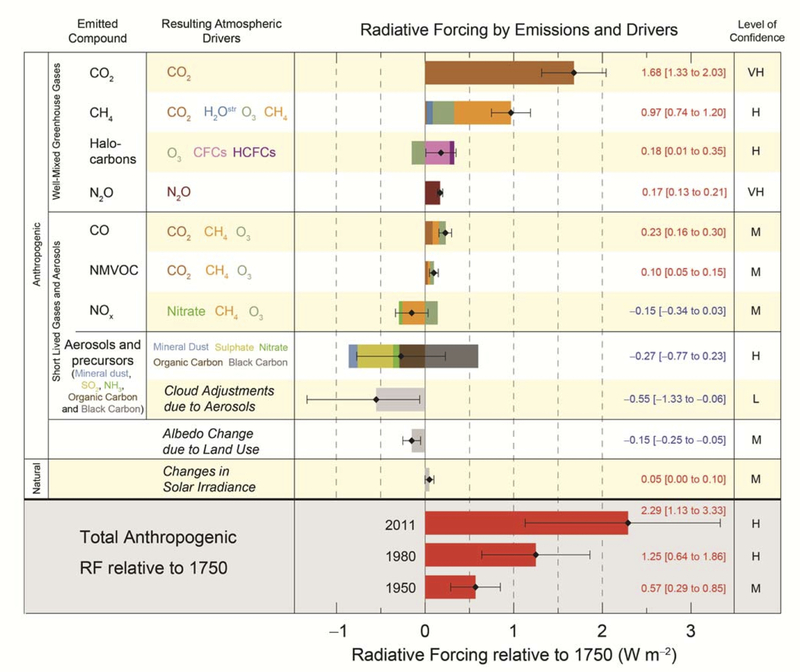 Atmospheric warming due to human-caused climate change. It’s the general measure we’ve used to track a devastating and ongoing heat amplification due to a terrible greenhouse gas emission. But if we were to look for where the greatest amount of that heat has accumulated, it would be in the world’s oceans. For from its air-contacting surface to its depths thousands of meters below, the World Ocean has captured 93.4% of the total heat forcing humans have already unleashed. The remainder is almost evenly divided between the atmosphere, the continents, and the ice. We rely on floats and deep-plunging sensors to keep track of total ocean heat content. But on any given day we can see well enough what is happening at the surface. And today ocean surface heat is screaming through the world’s satellite sensors. Overall global anomalies are spiking higher than +1 C above the 1979 to 2000 average. In the Equatorial Pacific, an El Nino that looks to be far stronger than the one that occurred in 2009-2010 is building, heating a massive wedge of the Eastern Equatorial Pacific to +2 to +4 C above average. And in the far north, we see extraordinary high surface water temperature departures exactly where we need them least — bordering Greenland and the remaining Arctic sea ice. For encircling the Arctic from the West Coast of Greenland, to Iceland, to Svalbard, to the Barents and Kara Seas, to the Chukchi and on to the Beaufort we see surface water temperatures ranging from 2.25 to 4 C or more above average. And just west of Svalbard, we have water temperatures ranging in a zone exceeding a terrifying 8 C above average. When a sea surface temperature departure of 0.5 to 1 C above average is considered significant, these values represent extremes that are far outside what was once considered normal. Such high surface water temperatures have numerous effects. The first is that adjacent submerged ice sheets, such as the calving faces of Greenland’s great glaciers plunging into the ocean, are faced with a far greater melt pressure than before. The glacial fronts in many cases expose 500 or more feet of ice directly to these much warmer waters. And on almost every side of Greenland, but especially in the west, along Baffin Bay, these great ice masses are confronting extraordinary warmth. The heating is without respite. It occurs at all hours of the day and since it is delivered by water, it is many times more energy intensive than a similar volume of equally heated air. In the sea ice edge zone, the warmth also provides added heat pressure to the vulnerable and already greatly thinned ice floes. This heating is especially apparent in areas where continental rivers disgorge their waters into the Arctic Ocean. Warmer than normal water temperatures have coincided with much warmer than normal land temperatures, particularly over tundra regions like Canada’s Northwest Territory and the Yakutia region of Russia. These warmer lands result in warmer river flows. 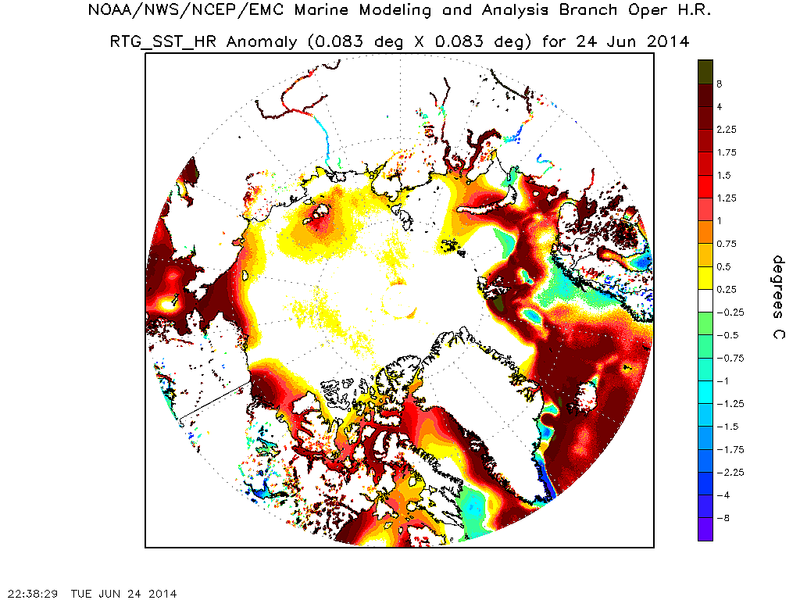 And the hot rivers spill into an already hotter than usual Arctic Ocean. The result, as we can see in today’s MODIS satellite shots are numerous zones of greatly thinned ice. A Beaufort Sea confronted with warm water outflow from the Mackenzie River, sea surface temperatures in the range of +1 to +4.5 C above average, and a broad swath of above freezing air temperatures, is now starting to show major melt effects. 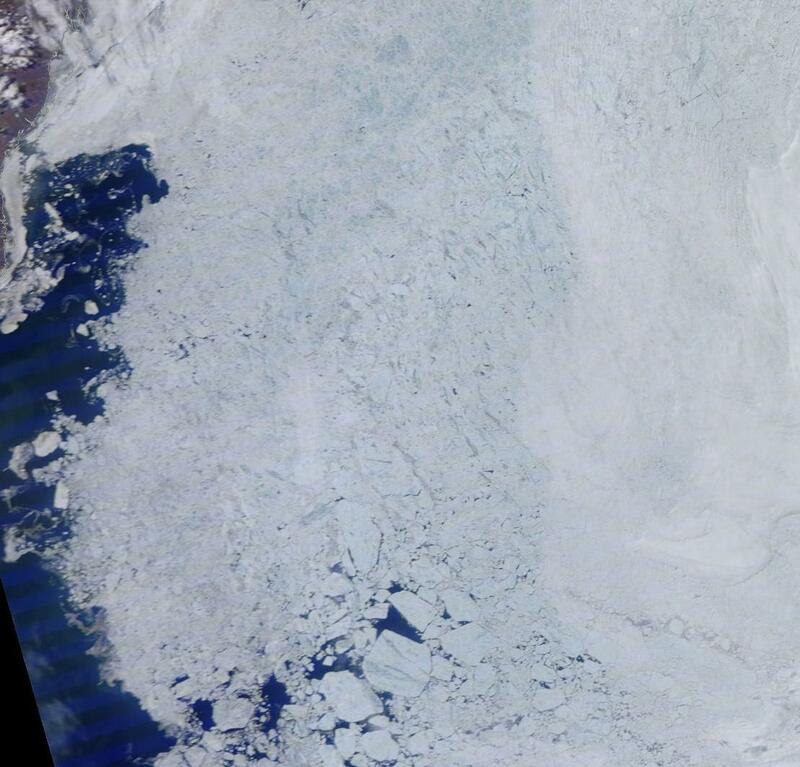 The sea ice has already withdrawn by as much as 150 miles from a broad section of the Canadian and Alaskan coasts. The off-shore ice features numerous very large polynyas and leads. And, overall, the ice has taken on a bluish tint indicative of widespread melt pond formation. Meanwhile on the far side of the Arctic, effects appear to be even more widespread. Though sea surface temperature values are somewhat lower than those seen in the Beaufort, at +0.5 to +1.25 in most open water areas, the entire region is rife with 150-200 mile wide polynyas, shattered and broken floes, and thinning (blue in the satellite picture) ice covered in melt ponds. The ice in this region is so frail that even the mildest storms, featuring 15-20 mph winds, are enough to rip through and splinter previously contiguous ice. And the storms in the region this year have been quite mild, ranging from 990 to 1000 mb in strength. Sea ice measures show current area and extent at between 3rd and 5th lowest on record. That said, observed ice response to even the mildest high and low pressure weather systems reveals a startling vulnerability with much warmer than normal sea surface temperatures surely a contributing factor. In net, much warmer water temperatures and retreating sea ice in the Northern Hemisphere trigger both Jet Stream erosion and increasing south to north air flow. Over the continents, where lands are far more susceptible to rapid warming, this can result in Arctic regions seeing summer time temperatures comparable to those in latitudes much further south. Over the past week, temperatures in the upper 70s to upper 80s (Fahrenheit) covered a broad region of Canada’s Northwest Territory including Alberta and the Mackenzie Delta region along the Beaufort Sea. These temperatures, in the range of 20-25 F above average rapidly dried out the shallow topsoil zone over the frozen and thawing tundra. Such rapidly dried soil and newly liberated tundra is a volatile fuel for fires. The human-thawed tundra itself contains burnable organic material and hosts pockets of methane while the dry soil bed is suffused with tinder-like grasses and shrubs. Any ignition can set off extraordinary fires of almost unimaginable scope and intensity. 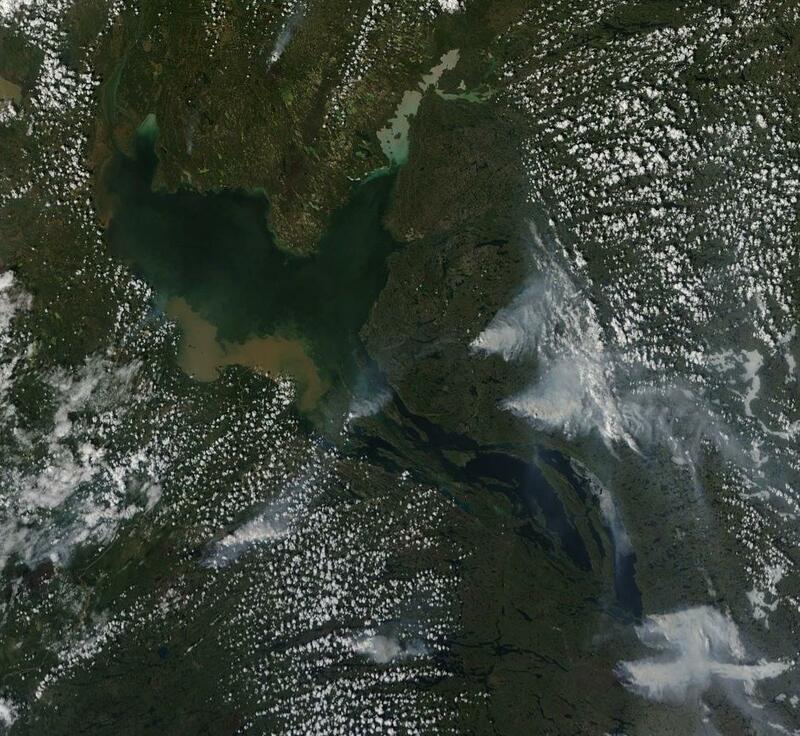 By June 24, four massive fires, each with a front ranging from 20-30 miles in breadth, raged along the shores of Great Slave Lake in Northwest Canada. Four smaller, though still significant fires also burned nearby. The fires are plainly visible as white, comet-like plumes of smoke in the satellite picture above. For reference, Great Slave Lake is more than 200 miles across at its widest point. Bottom edge of frame is about 300 miles. To the south and east by about 250 miles lies the Fort McMurray tar sands operation. A smaller, though still intense, tundra fire raged within 20 kilometers of that sprawling site but did not yet encroach on one of the most powerful and dangerous means of carbon-to-atmosphere delivery on the planet. These fires were sparked by temperatures that, during recent days, ranged in the 80s and even 90s. An extraordinary heat forcing for rapidly melting tundra regions that also saw far warmer than typical temperatures this past winter. This area, about 800 miles to the north of Lake Baikal, Russia, is a region of rapidly thawing tundra that has burned again and again during recent summers. For scope, the satellite shot frame, above, is 750 miles on an edge. In the picture are about 50 fires with fronts ranging from 4-35 miles. This spring, a broad area to the south of the current fire zone and just north of Lake Baikal saw massive fire activity prompting Russia to dispatch an army of hundreds of firefighters to the region. Such intense fire activity so early was unprecedented for Russia. But the real fire season typically peaks from mid July to August. And, in the above picture, we see what is likely the opening salvo for the summer fire season in earnest. Smoke and soot from these massive fires are swept up in the circumpolar Jet Stream. There they are born aloft for hundreds of miles, often traveling northward to find a final resting place upon the sea ice or atop Greenland’s glaciers. This ultimate darkening of the snow further enhances glacial melt even as it completes the cycle of warmth, finishing a dance of heat that rises up from the oceans, assaults the ice, and heats the once frozen lands to erupt in flame. Where is Global Warming Going? Scooped and reblogged. Thank you Robert. What is that big brown patch on the left side of the lake? That’s sediment from the Slave River. The heat is on in Greenland, where the high temperature on Tuesday hit an unusually warm 67°F at Kangerlussuaq (Sønder Strømfjord) in southwestern Greenland. It’s been a hot June at Kangerlussuaq, where the temperature peaked at 73°F on June 15. That’s not far below the all-time hottest temperature ever recorded in Greenland of 78.6°F, set just last year on July 30 at nearby Maniitsoq Mittarfia, as documented at wunderground’s extremes page. The unusual warmth this year melted nearly 40% of the Greenland Ice Sheet in mid-June, according to data from the National Snow and Ice Data Center–far above the usual 15% figure. The warm June temperatures could be setting the stage for a big Greenland melt season this summer, and scientists with the Dark Snow Project are on the ice, 48 miles east Kangerlussuaq, conducting a two-month field experiment on the causes and implications of Greenland ice melt. Read this earlier today. Great article. A new study by NASA the National Snow and Ice Data Center indicates that the Arctic “melt season”—the time of the year when temperatures are warm enough for ice to melt—is getting longer all the time. There’s a lot of variation from season to season, but the overall trend is clear: The melting season has been increasing about five days every decade since 1979. Freeze season delays as well, on both ends, we add about a month by now. Haven’t seen a similar study for Siberia, but given the fire seasons we’ve seen there recently, it appears pretty obvious the situation is similar. This is so tragic. The boreal forest hosts many thousands of plant and animal species that will be going up in smoke. I should pass this information along to bird conservation organizations like the American Bird Conservancy and the Cornell Lab of Ornithology, though I hope someone there is paying attention. Each spring I (and many hundreds of birders) eagerly await the migratory transit of boreal forest birds through New England on their way to the northern forest or the arctic tundra. Some of our most beautiful birds, which winter in the tropics, nest up there. I wonder how soon loss of habitat from fires will impact their population levels? This century will be rough for everything. Considering we’re probably at threshold now, we’ll probably see impacts within this decade or the next. Thanks for your comment Robert and all the great recent posts! I’ve been spreading the news about your blog to a few people. Has traffic to this site increased over the last few months? Very significant increase in traffic. Month to month it’s 10-20 percent. We’re looking at double the monthly traffic seen at the beginning of the year by end of June So huge thanks for the help, Mark! 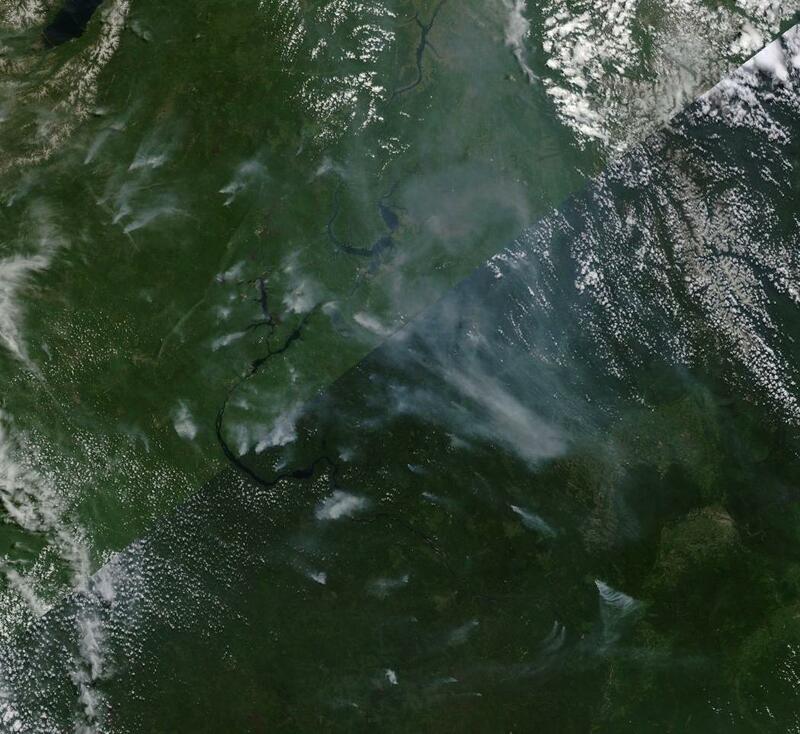 Wildfires to the north and west of Lake Baikal in central Siberia expanded again today. Now they cover a 1,000 mile swath of tundra and boreal forest. Basically, Greenland Ice Sheet is heading for a tipping point sooner than we thought. Add to this the recent paper on WAIS instability, and we seem to be in for some ugly sea level rise surprises. The hits just keep coming. Boy was this the year of the glacial butcher board. Wow, just read the abstract and article. Stating the obvious but the loss of summer sea ice in the arctic has to be a crucial step in increasing greenland’s summer melt. Loss of sea ice insulation is a huge blow to the ice sheets. Confirmation of what we’ve been asserting for about a year and a half. OK. Let’s think about this report a little bit. Apparently, enough ice to raise sea levels by 4-6 meters was lost from Greenland during a time when temperatures on the Greenland ice sheet were 1 degree C hotter than today. The study states we reach these temperatures by the end of this century. If we cut greenhouse gasses to zero today, we might limit current overall warming to 1 C.
However, the study cites temperatures local to Greenland. In which case, those temperatures are rising extraordinarily fast. Since 1979, temps over the ice sheet have risen by 1 C per decade. This puts us in the range to lock in 4-6 meters from Greenland alone within 10 years. Regardless, it’s probably best to use paleoclimate proxies to determine how much sea level rise we’ve ultimately locked in. Considering current CO2 and other ghg levels, paleoclimate indicates that we’ve locked in at least 75 feet of sea level rise long term. The question remains, though, how rapidly does Greenland respond to what is already a breakneck pace of warming. Probably more rapidly than most would hope. The changes in the Arctic relating to sea ice cover and snow cover are a major tipping point that adds an enormous forcing to the climate in addition to greenhouse gases. Here is a direct quote from the abstract of a paper (Feb 2014) that attempted to quantify the extra warming in the last 30 years do to the loss of sea ice in the arctic. That is a really big deal. I have read that if all of the sea ice was gone it would total a forcing of .7 W/m2. This would be about equivalent to the current overall forcing with all natural and manmade influences combined in if I’m not mistaken. Even if the arctic doesn’t reach a completely ice free summer/fall state it will continue to increase as a major factor in Earth’s energy gain. Here is the link to the paper. Total global net positive forcing from all ghg is 2.3 watts per meter squared once you subtract out aerosols. A .7 w/m2 increase would be slightly less than the total current forcing provided by the methane portion of the ghg overburden. Thanks, that makes sense. 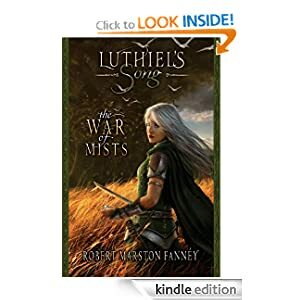 I heard that number thrown around by Kevin Trenberth a year ago but I think it wasn’t being used in the same way that I was thinking. Here are the most recent NASA GISS estimates for climate forcing for anyone interested. Thanks, I like that link better. It does seem to estimate solar variation as quite small and now quite overwhelmed by the GHG forcing. The IPCC produces top rate data, one of the reasons conservatives have tried so hard to smear it. Looking at the jet stream up north it looks like the area around eastern Greenland is settling down from the chaos earlier in the spring. It is also taking on the same shape as the sections over N. Alberta/NWT and N. Russia (the “heat blob”). I’m not sure if this organization will lead to a 3rd hot spot, but the anomaly is starting to take on the same shape as the others. Something to watch in case it dissipates or strengthens. 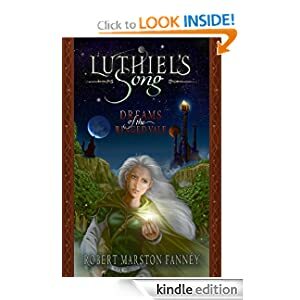 A great read Robert, more folks need to see this kind of thing. That Greenland high has been pretty persistent over the past month. Combined with very warm waters surrounding Greenland, this can create a kind of amplifying heat lens effect. Not looking as strong this year as 2012 yet, but still rather worrisome. Temps in Greenland remain very warm and we have melt ponds beginning to form all over the periphery. Actor Rob Lowe and his wife were involved in a dramatic rescue on Wednesday morning after they were caught up in severe flooding in France. The southeastern region of the country was hit by heavy rain in the early hours of Wednesday, with some areas receiving the equivalent of three months rainfall in just four hours, leading to rising water levels and serious flooding. Near celeb miss. Wonder if Lowe will campaign on climate issues after this? A MONTH of rain fell in Haute-Garonne in three hours last night, flooding basements and underground car parks. National forecaster Météo France reported that 55mm of rain fell – equivalent to the average rainfall for the whole of June – and it has predicted more storms throughout the week.. The west of Toulouse was particularly badly hit. Emergency services were called out 130 times, as rain and hail caused basements and underground car parks to flood – and even cut off roads. I’ve only been following them for a month but the first one is very reliable and to the point. The permafrost accumulates heat. Under pressure, some of it melts, forming a basal lubricant. Slope structures speed up, creating more friction and basal melt pressure. The slow motion permafrost slide speeds up. The permafrost is the ghost of the great glaciers of the last ice age. We’re watching its disapperation. Hello. Thanks for what you have done. And staring into this abyss, then reporting back. My question. The sea surface anomaly pic. Shows that over the Arctic there are spots throughout the whole mass of the ice sheet? Where is that heat coming from? And do we know how deep that heat is through the ice sheet. It looks like it is getting ready to fragement. From the top down. Your thoughts. Thanks Mike the Father of 3. The sensor is IR and can either interpret breaks in the ice or melt ponds as water. So the warmer than normal areas within the ice are probably one or the other. Best you, Mike. Let’s hope we can help clean this mess up for your 3. A new study suggests that a warming period more than 400,000 years ago pushed the Greenland ice sheet past its stability threshold, resulting in a nearly complete deglaciation of southern Greenland and raising global sea levels some 4-6 meters. The study is one of the first to zero in on how the vast Greenland ice sheet responded to warmer temperatures during that period, which were caused by changes in the Earth’s orbit around the sun. …a team led by Alberto Reyes of the University of Wisconsin-Madison has evidence that the southern Greenland ice sheet melted during a relatively warm spell that interrupted the ice age. If they are right, the planet may already be warm enough to unleash a collapse. “Our study provides the first evidence that the southern Greenland ice sheet has collapsed in the geologically recent past,” says team member Anders Carlson of Oregon State University in Corvallis…. Indirect evidence suggested the ice sheet shrank considerably back then, but there was always a question mark, says Richard Alley of Penn State University in University Park. “I would probably take the question mark off now.”…. All this means Greenland’s ice may be on course for full-scale melting. But it is difficult to pin down the temperature tipping point when a collapse becomes inevitable. “We might pass it before we know,” says Alley. We don’t know how much warmer Earth was 400,000 years ago. “It may have been as little as 1 °C warmer than present,” Carlson says…. “We can only hope it takes a long time to happen,” says Tim Lenton of the University of Exeter, UK. The word “collapse” implies a sudden process, but in human terms ice sheets disappear slowly. In the case of Greenland, it will probably take centuries, says Alley. That’s because friction with the underlying rock slows ice flow into the sea, setting speed limits. But Antarctica’s sheets may melt faster. Its valleys open out into much wider canyons than those in Greenland, so the ice feels less friction. “There remains a chance that west Antarctica doesn’t listen to the speed limits,” says Alley. It will be no surprise to many people living in Minnesota and Iowa that rainfall has been well above average this month. Minnesota is still having some of it’s worst flooding in years from the heavy rain that fell recently. The analysis above was made by comparing TRMM based merged satellite rainfall data for the twelve year period from 2001-2012 to “near real-time” Multi-satellite Precipitation Analysis (TMPA-RT 3B42RT) data collected from June 1-25, 2014. Rainfall this month was shown by this comparison to be over 5.5 times normal (> 550%) in some areas of Minnesota and Iowa. Been trying to get a satellite shot of it but too much cloud cover. Note that they compare to the 2001 to 2012 baseline. Already a period of increasingly intense storms for this region. India is staring at the spectre of a possible drought as the progress of the monsoon has been abysmally slow, with authorities saying cumulative rainfall across the country has been 45 per cent below the average for this period. The reason: the El Nino effect is adversely affecting this year’s monsoon, say weather experts. The India Meteorological Department (IMD), in its latest report, has highlighted the weak and delayed onset of the monsoon. An analysis for the period from June 1-18 showed that rainfall has been deficient across the country. The cumulative rainfall across the country has so far been 45 per cent below the Long Period Average (LPA) for 1951-2000. The monsoon, which provides 80 per cent of the total rainfall in the subcontinent and on which India is completely dependent for its agriculture, is witnessing disturbing changes. There has been a decline in the average total seasonal rain during the period 1980-2011, according to a new study. The study was carried out by Stanford Woods Institute for the Environment, the Stanford University’s hub of environment research, and published in the latest issue of Nature Climate Change. It also found changes in the atmosphere like winds and moisture which are likely to be responsible for changes in wet and dry spells. After studying trends of monsoon rains over 60 years, the researchers have warned of extreme weather conditions in future. Twenty-five per cent of India’s total land is undergoing desertification while 32 per cent is facing degradation that has affected its productivity, critically affecting the livelihood and food security of millions across the country. As much as 105.19 million hectares (Mha) of the country’s total geographical area of 328.73 Mha is being degraded, while 82.18 Mha is undergoing desertification. The major forms of land degradation include soil erosion (which accounts for over 71 per cent of the total degradation), and wind erosion (10.24 per cent). Saw this yesterday. Absolutely brutal. They’re saying it’s as bad or worse than 2009, which was a terrible year for them. Knowing where water vapor is in the atmosphere is one of many factors forecasters use to identify weather features. The NASA/NOAA GOES Project has now created two new types of animations based on satellite data that indicate where water vapor is moving over the Atlantic and Eastern Pacific oceans. My wife and I spent much of our middle years and earned most of our retirement income from systems analysis. Which means we spent most of our time explaining how a change to the member input screen can change the balance sheet report (The example should show two apparently unrelated parts of the database.). As a systems analyst, I really think a talented and insightful writer might link these distantly related effects more. Readable relations of such a causality chain avoid the (red herring) question of, “was this event caused by AGW?” and replace it with irrefutable common sense. First of a 5 part series . In the Reno paper. According to local residents in the Tokyo metropolitan cities of Mitaka and Chofu, several dozen centimeters of 10-yen-coin-sized hailstones fell on the area in the space of about an hour starting from around 3 p.m. Locals also said that the mix of heavy rain and hail formed whirlpools of ice and water in some places. My common sense & “intuition” says that the earth is flat. The thread has moved swiftly, & this typo (?) has gotten lost. Local forcing vs global forcing. It’s a big deal, though. Gerald, I should have just left the quote from the paper alone with out adding my info. I’m in a different field of science and climate science is so complex my apologies. No worries, it’s easy to miss. The amplifying feedback in the Arctic is extreme, even when you just count in the loss of Albedo. It’s worth noting that the loss of ice from the global cryosphere (sea ice, glaciers, snow cover etc) is estimated to have a positive radiative forcing of +0.45 watts per meter squared over the last 30 years (1979 to 2008). The total cryosphere albedo is -2.2 to -4.6 watts per meter squared. So loss of all the ice globally at least effectively doubles current human ghg forcing. Other albedo changes are in effect as well. Current forcing + feedbacks, in total, is likely enough to raise temperatures, long term, by about 3.8 C. In this range, we probably lose about 1/3 to 1/2 the cryosphere at equilibrium assuming as ghg feedback from the Earth System roughly equal to that of paleoclimate. CBob; the Reno news article that you recommended has a distraught local hoping/praying for El Nino as salvation. Still, this event was so vast that it was hard to protect everyone, everywhere. Huge stream of moisture headed that way again. I have 4-5 articles I should be writing today. Might get out two. Nick Breeze has just posted his recent three part interview with Natalia Shakhova on YouTube. In part 3 sainted Natalia calls for “cooling the Arctic” as our best hope. Thank you Robert for the great work you are doing.